First, I was a little confused- because part of the deal post-flood was that UIMA couldn't return to their old building because it's proximity to the river and two floods within twenty years pretty much meant that their insurance was done dealing with that. But, then I actually did some active reading of the article I linked to above and noticed that they were planning on building parking underneath the building to elevate it above and out of the flood zone. Second, if you wanted an art museum that is more directly connected to campus this does it and then some. 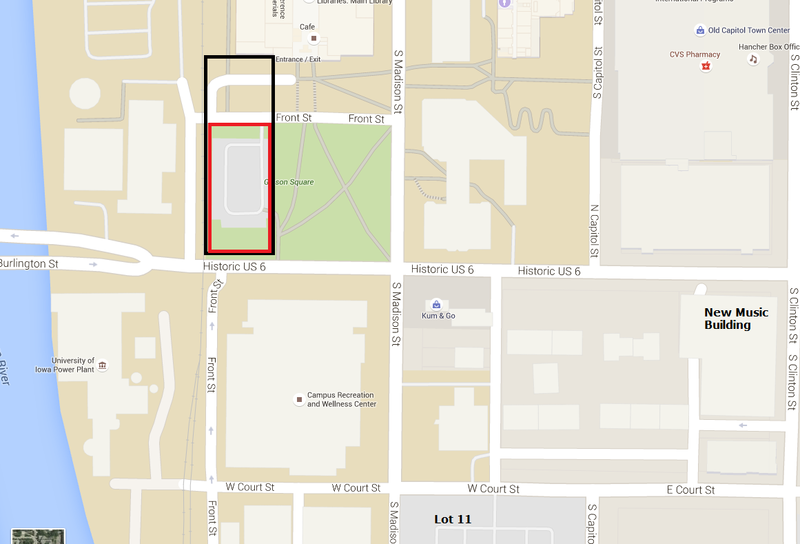 I don't know what the building plan is going to look like- so I don't know if they're going to directly connect it to the Main Library (black rectangle) or have a skywalk/bridge to a facility (red rectangle)- but either way, you're putting it in an area where a lot of students will be. Whether it's in the CRWC working out or looking for a place to study in the Main Library, it's a high traffic area for students- a big plus. Then you've got to consider the motor vehicle traffic alone. That stretch of Burlington Street- hell, any stretch of Burlington Street is going to see thousands of cars each and every day- all driving past a building that I'm betting will be designed to be noticed. Third, you have to applaud the genius of the location. With it's proximity (and I'm guessing the emerging partnerships) with the Main Library, it allows you to pare down the design to place the focus on where it should be: the art. They don't need to worry about an auditorium or a bunch of extra trimmings because they're right next door to a pretty nice one and recently renovated to boot. Plus, you're just down the hill from the new Music Building- a couple of blocks away from the Old Capitol Town Center and Lot 11- which just increase ease of access and available parking. Fourth, let's consider this sentence: "Large site allows for future expansion and additional parking." Hmm... welll, that could be the difference between my black rectangle and red rectangle up there, or it could be... something else. Let's consider the Riverfront- such as it is, in downtown Iowa City. What exactly is all that iconic about it- especially right next to Iowa City's busiest street? If we cast our eyes far into the future, you've got to think- what if they relocate the Water Plant? Or the Power Plant? I don't think it's likely anytime soon- but if you're looking to get a new facility in place and keep it there permanently- the obvious move for a future expansion is toward the river. Especially if you're elevated and out of the flood zone. In short, I was a little disheartened when the University announced that it was pulling out of the Clinton/Burlington site. Now, I'm excited again. When they can get this done, however, is a question that I'd love to find out. Hopefully it's soon!